Hey, Lucy, hi BDSG, I hope you're fine? Hi, dad, hi BDSG, I'm fine, thanks! You look quite... different, dat? I'm fine, too! Thanks for asking. Lucy, you really built some great resorts in Rio and on Hawaii and our shareholders are more than happy. There was a unanimous vote that you and BDSG should build a new resort in Miami. BDSG and I look forward to fackling this new challenge with my old team. Here's a first draft, what do you reckon? Hey, Lucy, hi BDSG. Nice to see you again! Let's start with the main building. 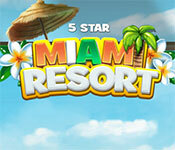 This game has a free trial version, click to start 5 Star Miami Resort Free Download. If you like it, please buy the full version to support the developer, thanks. Sign-up to get informed when the 5 Star Miami Resort series has new game released with BD Studio Games' FREE bi-weekly newsletter.